A bushel of tomatoes weighs about 53 pounds. A bushel of tomatoes will yield approximately 18 quarts of canned tomatoes or, if juiced, about 15 to 18 quarts of tomato juice. A tomato’s weight will vary depending on what kind of tomato it is. For instance, a Beef Master tomato is more juicy. And, therefore, a Beef Master has a higher water content. That means it will weigh more. This is compared to something like a Roma tomato, which is light and more fleshy. And, therefore, a Roma will weigh less when put on the scale. 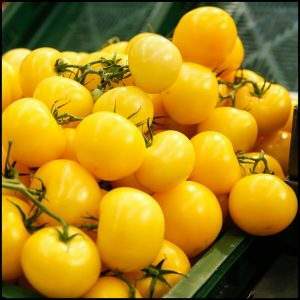 In fact, the Roma tomato (also called a plum tomato) is the least juicy and least succulent of all the tomato types out there. 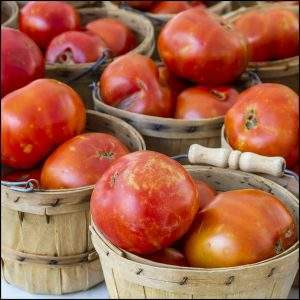 “Plump thing with a navel” was the literal meaning of the Aztec name originally given to tomatoes. Peru is where tomatoes originated from; but the ability to easily grow them, quickly led to them spreading to Europe and other parts of the world through trade. 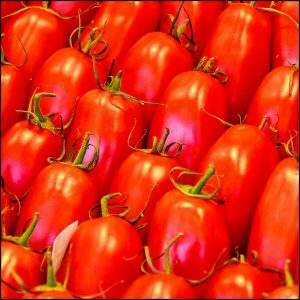 It was the mid 1500s when the first Europeans began to enjoy tomatoes at home.